My timing in life is terrible. When I book a flight, cumulus clouds immediately begin plotting to cover the destination on the appointed day. When I plan a special menu for a dinner party, the supermarket runs out of a key ingredient. And when I offer a benign economic outlook, the likelihood of an unexpected shock to the global financial system rises significantly. Nevertheless, I was hopeful that the timing and tone would be ideal for my trip to Western Canada last month. The White House rhetoric on trade was cooling, and Canadian Prime Minister Justin Trudeau had held an encouraging meeting with President Trump early in the year. Most of the international anxiety in the past month has centered on North Korea, and most of the continental focus has been on relations between the United States and Mexico. But two days before my departure, the White House announced punitive tariffs on Canadian lumber and promised to upend the North American Free Trade Agreement (NAFTA). As an early point of retaliation, the Canadian government implemented enhanced screening procedures for American economists visiting the provinces. I was eventually allowed to cross the border, but my presentation booklets were deemed subversive and confiscated by the authorities. The sudden contretemps between Washington and Ottawa was more than a personal annoyance. It suggests that U.S. trade policy remains unpredictable and unproductive. And it creates an unnecessary risk for the Canadian economy, which shares a significant economic partnership with the United States. Canadian/American cooperation has historically been a model for other nations to follow. The countries share a 5,525 mile boundary that is largely unguarded. Each is a very significant trading partner for the other, and there is significant cross-border sourcing between the two. Neither, presumably, is anxious to put all of that commerce at risk. 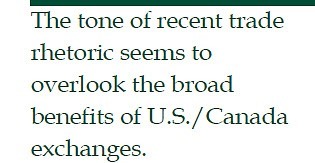 Last week’s salvo on softwood lumber imports from Canada (which was quickly dubbed the “timber tantrum,” or “lumbergate”) was a surprise on several fronts. Firstly, the U.S. administration had been backing away from its harsh anti-trade talk. Its posture on China took a nearly 180-degree turn after President Xi’s visit to Mar-a-Lago; and the border tax, which would have proven inflammatory to America’s trading partners, was not a component of the tax reform proposal announced last week. The White House approach to trade seemed to be maturing, along with its appreciation of globalization’s benefits. Secondly, the issue with wood imports is not at all new: it has been handled privately on a number of past occasions. Resolution procedures for situations like this are available to all members of the World Trade Organization, and they work quite well. But this time, Washington chose a very public calling out of grievances over lumber, and the president followed with a comment that he “was going to terminate NAFTA as of two or three days from now.” North of the border, the communication was taken as alarming and disrespectful. Potential retaliatory measures are certainly possible. But with the Canadian economy at something of a delicate juncture, a trade conflict would come at a bad time. Canada takes considerable pride in having avoided the worst of the financial crisis, and part of its success was due to its discipline around home lending. Interest on mortgages is not tax deductible in Canada, loans are not prepayable without penalty and lenders have full recourse to a borrower’s assets in the event of default. Canada has been a significant beneficiary of overseas investment during the past decade, much of which has gone into its property markets. Since 2007, Canadian home prices have doubled overall, and prices in Toronto and Vancouver have escalated even more rapidly. This trend has made it much more difficult for residents to break into the market. Locals who purchase homes have required increasing amounts of leverage; Canada has one of the highest household debt ratios in the developed world, with much of it composed of mortgages. But as property values have headed further into the ether, concerns about the health of household credit have increased commensurately. The recent trouble at a Canadian subprime lender offered a further red flag. The challenge for policy makers is to dampen, but not crush, the enthusiasm. Since an increasing fraction of demand is coming from cash purchasers (many of them foreign), traditional curbs on credit availability have limited influence. Recognizing this, the provincial government of Ontario recently announced a series of measures that have been employed to good effect elsewhere in the world. A surtax of 15% was placed on property purchases by foreign acquirers, an extra tax has been added for vacant homes and flipping property prior to construction has been prohibited. We’ll know over the coming months whether these disincentives are strong enough to offset the desire of overseas investors to hold assets in stable locations and diversify their currency risk. 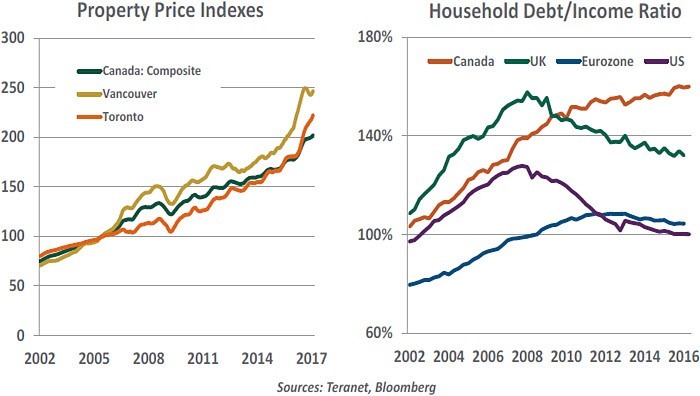 Even if a crash can be avoided, Canadian households cannot continue to accumulate leverage at the recent pace. Some austerity is in order, which will limit consumption. 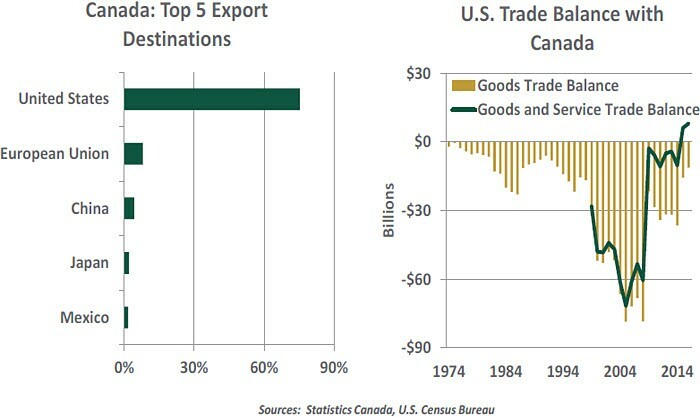 If a major interruption in exports to the United States is added to the mix, it might be enough to tip Canada into recession. Recent salvos from Washington may prove to be a prelude to a more measured series of private (and hopefully productive) conversations. To their credit, Canadian officials took the high road, but noted that “it is no accident that hockey is our national sport.” From an economic perspective, I am hoping cooler heads prevail so that the value of cooperation is preserved. And from a personal perspective, I am hoping the dispute gets resolved quickly so I am not sent to the penalty box again while passing through customs. Traditionally, changes in the unemployment rate and housing sector activity are closely related because improvements in the labor market encourage demand for homes. Based on this association, home sales and construction should be showing a robust performance. But the housing market remains hindered by several factors, some of which are the legacy of the 2008 financial crisis. 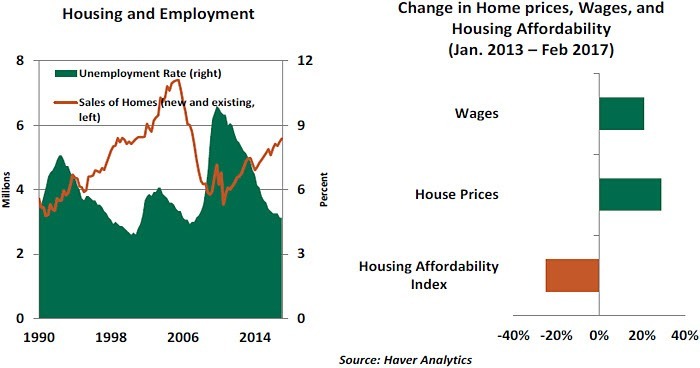 In addition to employment conditions, “affordability” is among the elements that determine housing market activity. The Housing Affordability Index (HAI) of the National Association of Realtors compares median family income to the income required to to qualify for a mortgage on a median-priced home. Rising incomes help the HAI, as do falling mortgage rates. The HAI consequently improved markedly through 2012, as the Fed’s quantitative easing program helped bring down the 30-year mortgage rate to a historic low of 3.35%. At this time, home prices were still 25% below their 2006 peak. However, the latest national HAI was down 25% from its peak in January 2013. Since that date, home prices have appreciated by 35% and are now higher than the 2006 peak. There are pockets in the housing market where homes prices have scaled even higher. Further, the 30-year fixed mortgage rate is up 70 basis points from its low point. During this period, nominal wages increased about 21%, which is short of the gain in home prices. Other developments render it difficult to buy a home. The HAI does not capture mortgage underwriting conditions and creditworthiness of home buyers, both of which can present a challenge for potential homeowners. The latest Senior Loan Officers Survey from the Federal Reserve indicates that mortgage underwriting standards are neutral at best, suggesting that bankers are not particularly eager to extend a home mortgage. The regulatory environment since the crisis has been transformed, and the qualifying conditions to obtain a mortgage are more stringent now. As home prices have moved up, the size of the down payment required to purchase a home has followed suit, presenting a further deterrent to loan underwriting. Additionally, outstanding U.S. student loans reached a record high of $1.3 trillion in 2016, up from $0.55 trillion in 2007. The student loan delinquency rate rose to 11.2% in the fourth quarter of 2016 from 7.3% on the eve of the Great Recession. This change in the financial profile of prospective homebuyers is a significant setback, as it reduces their creditworthiness and increases the difficulty of qualifying for a home mortgage. The less-than-stellar financial status of potential homebuyers prevents the formation of households, which grew only 0.75% in 2016 after posting a stronger increase in the prior two years. Reflecting these headwinds, the fundamentals suggest only moderate growth in home sales in the months ahead. Construction of new single-family homes rose roughly 6.0% in the first quarter compared with a year ago, which is slower than the pace seen during 2015 and 2016 (+10%). Combined sales of existing and single family homes increased 1.8% in the first quarter, following a 4.6% gain during 2016. Many have been waiting for housing to contribute more meaningfully to the current expansion. A slow recovery was expected, given the central role the industry played in the financial crisis. But nine years on, this sector still faces myriad limitations that will temper the pace of activity and continue to limit overall economic growth. On the face of things, China continues to prove its naysayers wrong. Real gross domestic product (GDP) exceeded expectations to grow at a 6.9% annual pace in the first quarter of 2017, while nominal GDP expanded at a rate of almost 12%, its fastest pace in five years. Strong industrial activity is driving this growth, and some have taken this as a good sign. 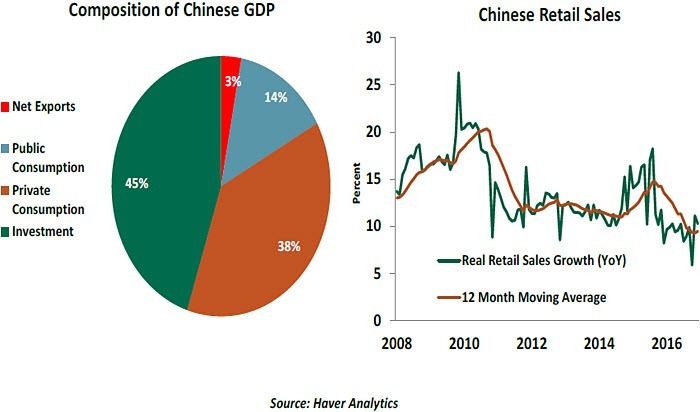 But if one looks beneath the surface, there is reason to worry about the quality of Chinese economic growth. On the back of a strong public investment boom, an unstoppable property boom and a revival in global demand for Chinese exports, industrial activity is growing almost twice as fast as private investment. This public investment needs to be reined in for two reasons. First, it is delaying the much needed rebalancing of the economy from investment towards private consumption. Secondly, the wedge between private and public investment growth is indicative of the falling returns on investment in China. Strong public investment under such circumstances points to capital misallocation, something that would eventually lead to a decline in productivity and balance sheet losses. On the property front, government policy intervention has met with limited success. If the government does eventually succeed in taming this market, the property sector will no longer be a strong contributor to growth. If it doesn’t, we must continue to worry about sustainability. 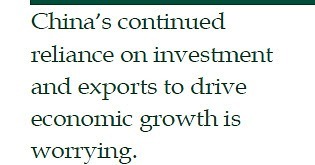 We cannot stress enough the need to change China’s growth model. Given the size of its economy, the incremental GDP growth China needs to become a high income economy cannot come from exports, as it used to. The global market is not big enough for that. Nor can public investment continue to drive growth – as it has in recent years - due to the reasons we have discussed above. China’s only choice is to move towards a private, consumption-driven growth model. Despite little progress on that front, we are hopeful that self-preservation will eventually prompt a course correction.